The RP Photonics Buyer's Guide contains 26 suppliers for distributed feedback lasers. Ask RP Photonics for advice concerning different kinds of single-frequency lasers. A distributed-feedback laser is a laser where the whole resonator consists of a periodic structure, which acts as a distributed reflector in the wavelength range of laser action, and contains a gain medium. Typically, the periodic structure is made with a phase shift in its middle. This structure is essentially the direct concatenation of two Bragg gratings with optical gain within the gratings. The device has multiple axial resonator modes, but there is typically one mode which is favored in terms of losses. (This property is related to the above-mentioned phase shift.) Therefore, single-frequency operation is often easily achieved, despite spatial hole burning due to the standing-wave pattern in the gain medium. Due to the large free spectral range, wavelength tuning without mode hops may be possible over a range of several nanometers. However, the tuning range may not be as large as for a distributed Bragg reflector laser. Figure 1: DFB fiber laser, containing a fiber Bragg grating with a phase change in the middle, directly written into a rare-earth-doped fiber. Most distributed-feedback lasers are either fiber lasers or semiconductor lasers, operating on a single resonator mode (→ single-frequency operation). In the case of a fiber laser, the distributed reflection occurs in a fiber Bragg grating, typically with a length of a few millimeters or centimeters. Efficient pump absorption can be achieved only with a high doping concentration of the fiber, and unfortunately it is often not easy to write Bragg gratings into fibers with a composition (e.g. phosphate glass) which allows for a high doping concentration. Therefore, the output power is usually fairly limited (e.g. to a few tens of milliwatts). However, this kind of single-frequency fiber laser is very simple and compact. Its compactness and robustness also leads to a low intensity and phase noise level, i.e., also a low linewidth, although the fundamental linewidth limit (the Schawlow-Townes linewidth) is higher than for longer fiber lasers. Semiconductor DFB lasers can be built with an integrated grating structure, e.g. a corrugated waveguide. The grating structure may be produced on top of the active region, which however requires time-consuming regrowth techniques. An alternative is to make laterally coupled structures, where the gratings are on both sides of the active region. Semiconductor DFB lasers are available for emission in different spectral regions at least in the range from 0.8 μm to 2.8 μm. Typical output powers are some tens of milliwatts. The linewidth is typically a few hundred MHz, and wavelength tuning is often possible over several nanometers. Temperature-stabilized devices, as used e.g. in DWDM systems, can exhibit a high wavelength stability. DFB lasers should not be confused with DBR lasers = distributed Bragg reflector lasers. The Koheras narrow linewidth, single-frequency fiber lasers are ultra-low noise sources with longitudinal single mode and single frequency operation. The lasers are based on a DFB design ensuring robust and reliable operation and are delivered as fully integrated systems for industrial and scientific applications. Koheras offers an unprecedented low phase- and intensity noise level at Yb, Er and Tm wavelengths. It has a very high stability, and mode-hop free inherent single frequency output – even when exposed to changing environmental conditions. You can also get shot noise limited solutions for applications demanding an extra low intensity noise level. Distributed feedback lasers are single-mode lasers containing an integrated grating structure. The result is a single-mode emission at an outmost precise wavelength with an extremely narrow linewidth. eagleyard provides the largest variety of wavelengths available on the market. Find your suitable DFB laser product between 633 and 1083 nm with output powers from 10 to 150 mW. RPMC Lasers offers a wide selection of distributed feedback lasers (DFB). Available in wavelengths from 760 nm to 2.1 μm, these DFB laser diodes offer a tunable single frequency output and are available in both free space and fiber-coupled configurations. 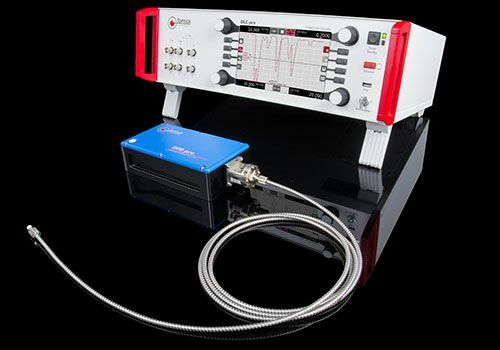 TOPTICA’s DLC DFB pro lasers integrate both distributed-feedback (DFB) and distributed Bragg reflector (DBR) lasers. Available wavelengths include 633 nm and the entire range from 760 nm to 3500 nm. Three laser heads accommodate different diode packages. Due to the absence of alignment-sensitive components, the DLC DFB pro lasers exhibit an exceptional stability and reliability. 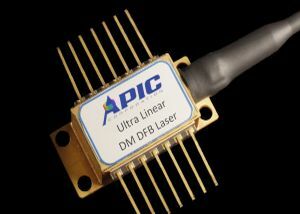 APIC has developed very low noise (RIN) DFB lasers in the 1550 nm wavelength range with models that perform direct modulation (DML) up to 6 GHz and continuous wave (CW) lasers. The DML laser come in a variety of optical power outputs from 10 to 40 mW with RIN between -160 and -155 dB/Hz. The analog/CW lasers have optical power output levels between 40 and 120 mW with RIN between -170 to -160 dB/Hz; some models maintain low RIN out to 20 GHz.